The troubled marriage between one Sunday Okafor and his wife Adetola Okafor was today dissolved by an Igando Lagos Customary court. 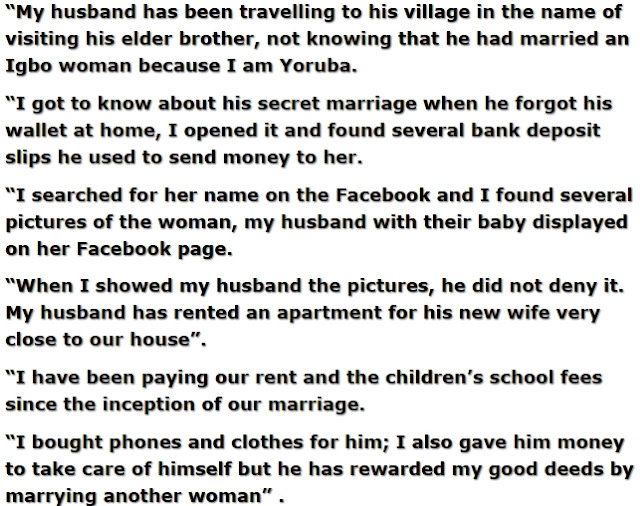 40-year-old Adetola whose unfaithful husband of 13 years was exposed after she found photos of his secret wife and child on Facebook approached the court for marriage dissolution. The mother of three who described her now estranged hubby as an ingrate said he married him in 2004 when he had nothing. However Mr Sunday Okafor who said his wife of 13 years is a dirty woman blamed her for pushing him into adultery. After listening to both parties, the court’s President Mr Omilola Adegboyega dissolved the union. This is why intertribal marriage is bad. Your wife of 13 years is dirty now that you have found an ibo girl. Shame on you lazy Okafor feasting on a woman’s sweat. THIS IS NOT ABOUT INTER-TRIBAL,RATHER ABOUT AN ATTITUDE, THEY WERE ALL WRONG TOWARDS THEIR APPROACH BUT MARRYING ANOTHER WOMAN WHILE STILL LIVING WITH HER IS UNACCEPTABLE. MY PITY GOES TO THE THREE INNOCENT CHILDREN. I agree wit u @Dammy, but we don’t knw how true it is about d wife maybe is dirty or not. I totally agree with Mon. This is not a case of tribe but ingratitude. It is an individual thing. I have a brother who is a medical Doctor and has been married for the past 20 years to a Yoruba woman and there has been no squabbles and their marriage is the strongest amongst my siblings. Like wise there is this Ibo girl, a PhD holder in her profession who married her Yoruba boyfriend and they have 3 children together. This very beautiful Ibo girl (from Owerri) sponsors her husband’s trips to London to visit his parents (that is where his parents live)little did she knew her husband was keeping a wife there. When she found out about her husband’s double life, she divorced him and married another Yoruba guy and now they have a boy. Can one now condemn all Yoruba guys as “Ogboni” did condemning all Igbos? it will be unintellectual to do so. And as for Dammy, you are wrong to say intertribal marriage is bad. Intertribal marriage is good as it binds us together and help foster unity which we crave for in Nigeria. America is great today because there are lots of international and intertribal marriages. This man is an ingrate, I am Ibo man, I totally condemn this wicked man, instead of going on his kneels to beg the woman who have been helping him, taking his responsibility, he still get rotten teeth to said that her wife of 13 years is dirty, Bia nwaokem, by the time you are enjoying the honey pot, you did not find it dirty, you have taken all her honey, you are calling her dirty? go and plead with the woman for forgiveness, unless you want to attract the wrath of God and the nature .Waite by the time your Ibo woman will ask you money three times a day then you will realize that there is different between hot water and cold water, I marry a Yoruba girl, I love her and we have been together for over 20 years, no problem, even when problem come, we make joke over it and it pass away. There is no race in this matter. What i will tell this woman is take courage and move on with her life, my ex husband did the same to me. He deceived me into marrying him, i gave birth to a boy for him but i later got to know that he was another’s woman husband so i divorced him. Am now living my life fully without a man now, working and enjoying my life with my little prince, but the most sad part of it all is that, he is no where to found. So my dear move on but if what your husband is saying about you not been clean then my dear start from some where and be neat cos some day you might or will marry again. Our are very lazy but when you give it t to the hand, it will do all the jobs. This guy excuses hold no water. He probably used his wife’s money in procuring the second wife and that is unfair. When it is time for God to expose ungrateful people like this guy, it only takes few minutes. The day his wife saw his wallet was the day that God wanted to put a stop in funding of this game player man otherwise she would have continue funding his life style. In a relationship, a man should know how to back pedal if you know you are not going to marry a girl and vice versa to women. This guy has wasted 13 good years of this woman’s time while coming up with dirtiness excuse. As I have been advising through this forum that a woman must learn how to clean up in order to keep a man. Not hygenic enough may turn some men off. If your man cannot attract to you sexually, the relationship along the line will start cracking. To all young women out there try to be neat enough for your man. You don’t have to put on expensive outfit or jewelries. We men always appreciate nice thing and being modest. Give yourself a thorough cleansing before you go to bed with a man. In this guy case he has never tried enough to change that woman’s habit because he knew he was going have a secret mistress. At times when you marry a woman, you have to subject to many changes and be more tolerant than you’ve ever been. This guy should not have given up about helping his wife in changing her lifestyle to suit his need. Helping him to raise his kids is a big help in a relationship but this guy doesn’t see it that way. Good advice from you jilo. Though that man may have a legitimate complain regarding his wife’s unneatness,but for sure that is not an excuse to abandon her for another woman. But honestly you women have to take it easy with we men too. Always giving close marking without breathing space to your husband,watching and trying to know whoever is calling him on phone will not help you as a wife. Such character does not depict any trust to one’s husband neither will it help the marriage. 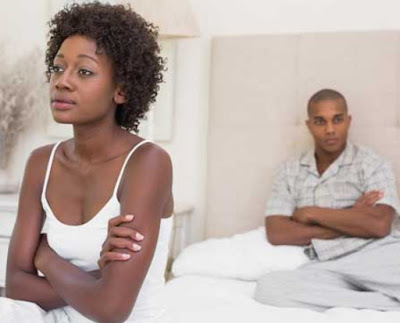 The fact is that you might just be damaging your husband’s relationship with others because of your over-zealousness to want to know who is dating your husband. Just as the husband in the story above complained that his wife ruined his business because of her constant accusation that he’s having affair with women who regularly visit his studio for music. You may just end up ruining your husband’s carrier because you want to protect him from been snatched away by desperate girls out their. Women my own advice for you is, always ensure you are neat at all times and watch your undies regularly. Remember to always give your husband breathing space. Stop accusing him unnecessarily of dating other women without any cogent evidence to back up your claim. Men take your time too and stop giving excuses to abandon your wife for other women. Let the married ones do everything within their power to protect their marriage. Scripturally, It does not pay to get divorced.